Color(s): Tri-Color; Black, tan, and white. Of the four Alpine breeds, the Appenzell Mountain Dog is the least well known and is extremely rare. Originating in Switzerland, this breed was used as a herd guardian, cattle mover, rescue dog, and cart-puller. Today, the Appenzell Mountain Dog has retained their working heritage and is difficult to find and acquire. The Appenzell Mountain Dog is muscular, athletic, and powerful. The Appenzell possesses tremendous endurance and agility. They are versatile, utilitarian, and hard-working. The Appenzell Mountain Dog is not recommended for first time dog owners. Although they are loyal and devoted companions, this breed is not solely a pet. Appenzell's are first and foremost a working breed. They are hardy, courageous, and affectionate. They are highly protective of their family, home, and territory. The Appenzell Mountain Dog does best with considerate children. They do well with other dogs and household pets they have been raised with. The Appenzell does not do well if they are isolated or ignored. They will become destructive if they are bored or lonely. They have a tendency to bark incessantly. 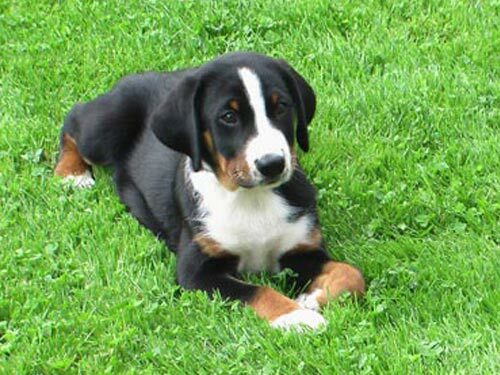 The Appenzell Mountain Dog breed is a double coat breed. The outer coat is short, thick, and glossy. The under coat is soft and dense. This breed is heavy shedding. Early socialization and obedience training is absolutely crucial. The Appenzell Mountain Dog breed is highly intelligent but requires a dominant handler. They do not respond to harsh or heavy-handed methods. Training must be done with firmness, respect, fairness, and consistency. The Appenzell Mountain Dog is not recommended for apartment or city living. This breed requires an inordinate amount of physical exercise and mental stimulation. They do best in a rural setting with room to roam and a job to do.